Americans are in love with their automobiles. Nothing beats the freedom of going where we want, when we want, with people we want– comfortably shielded from the elements while listening to our favorite music. While whizzing down the road in a metal shell may be dangerous, automobile manufacturers have become increasing safety conscious– incorporating safety glass, foam cushioning, anti-lock breaks and air bags – to name but a few automotive safety innovations. No sane person wishes to become a statistic of a car accident. Nonetheless, there are literally millions of car accidents on U.S. roads each year – from unreported, insignificant exterior scratches to horrific fiery catastrophes costing life and limb. Overall, the U.S. Department of Transportation (USDOT) reports that there are 6 million car accidents yearly on American roads, with 3 million people being injured – and 2 million of these injuries being permanent. An American is injured in a car accident every 14 seconds. In fact, over 25% of U.S. drivers are involved in an accident over a given 5 year period! Sadly, over 40,000 Americans still die each year while on the road, that’s one every 12 minutes. 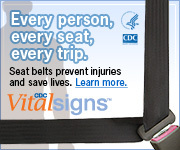 The leading cause of death in the U.S. for people between ages 1 to 30 years old is being involved in a car accident. According to the U.S. National Highway Safety Administration (NHTSA), about 40% of car accident fatalities occur because of a drunken driver, 30% are blamed on excessive speed, and 30% owing to reckless drivers in one or more vehicles. Insurance companies don’t want you to know that in nearly every car crash case, the person who caused the crash has insurance but the jury is not permitted to know this at trial. As a result, a juror might feel sorry for the at-fault driver because he or she thinks that the driver will have to pay the verdict. But, that’s not the case. The insurance company pays for the driver’s lawyers, court costs AND the verdict. Uninsured drivers were blamed for more than 8700 crashes across Ohio in 2010, last year for which statistics were compiled by the State Highway Patrol. They are at fault 3 of every 4 times they are involved in a crash. The state had 1.1 million uninsured motorists in 2011. That’s 1 of every 8 licensed drivers and an increase of 60% from a decade ago. Ohio has require drivers to carry auto insurance for injuries and property damage since 1953, but the states rate of uninsured drivers is among the nation’s highest. People renewing their license plates must only check a box declaring that they are insured, but the Ohio BMV doesn’t require car owners to provide any proof. In Maine, where less than 4.5 percent of drivers are uninsured, people must present proof of insurance each year when they renew their vehicle registration. Clearly, Ohio doesn’t do enough to combat uninsured drivers. At Goldberg Law offices, we have over 23 years of experience helping victims of automobile accidents and their families. We know how to bring claims for property damages, injuries or even death– knowing that while money alone cannot replace those so tragically taken, it can help ease future burdens of those who remain. We have a full-time physician on staff to review the nature of the injuries and technical consultants to help prepare your case for trial or settlement. We are not afraid to go up against any responsible party for payment due– no matter how large, wealthy or powerful they appear to be. We offer no-charge consultation and will be happy to discuss a potential claim involving injury and/or death from an automobile accident. Victims of car accidents and their families deserve compensation– and the best legal team to fight for them. However, any potential claim must be filed within the applicable Statutes of Limitation, which are very short. We can answer your questions about your claim and concerns about the time-frame in which to bring it. Don’t let the compensation you and your family may be entitled to lapse for failure to file your claim in a timely fashion. Please call today to discuss your potential car accident claim at no cost to you.